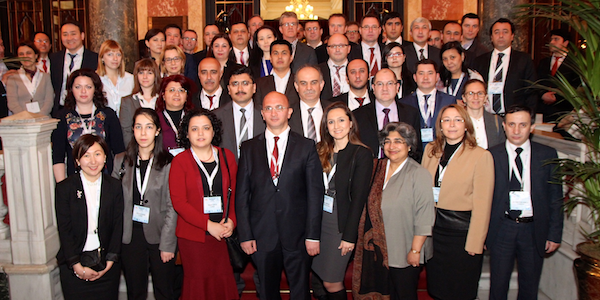 Participants from the National Capital Accounting Regional Workshop for Europe and Central Asia, Istanbul. 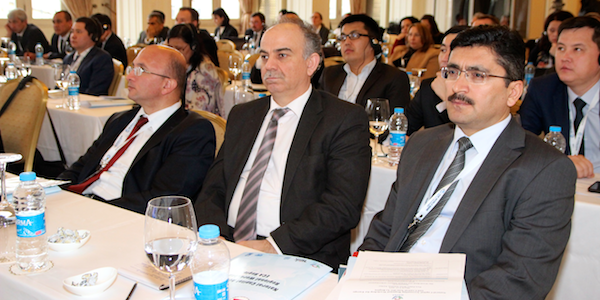 Participants from the Turkish Statistics Institute (TurkStat) attending a plenary session. From left to right: Mr. Mehmet AKTAŞ, Vice President; Mr. İsmail GÖKALP, Director, Istanbul Regional Office; Sebahattin Sari, Director, Environment, Energy and Transport Statistics Department. This video from the conference captures the event and highlights the voices of many participants. Background: The World Bank launched the Global Partnership for Wealth Accounting and the Valuation of Ecosystem Services (WAVES) in 2010, providing technical support to developing countries to implement Natural Capital Accounting (NCA). In 2012, in advance of the Rio+20 summit, the World Bank took the initiative to reach out globally through the 50:50 campaign inciting the public and private sectors to join forces, taking collective action in support of NCA. Since the launch of the campaign, the response has been overwhelming: 70 countries, 90 corprations, and 17 civil society members supported the campaign. Turkey recently joined WAVES as a participating country member. ansitions towards inclusive and green growth models. To construct accounts, countries need training materials, guidance, and the ability to share ideas and information. The ECA regional workshop is designed to respond to the growing interest in the region and surrounding areas on NCA. The first day will provide an overview of the SEEA-CF, WAVES, and NCA. The goal is to engage participants and encourage thinking on policy questions that NCA can help to inform in the region. Day 2 will focus on forest and water accounts. Day 3 will discuss the data and institutional requirements to ensure that NCA is institutionalized in countries. The workshop will close with a discussion of next steps for the ECA region surrounding NCA. Workshop participants: Participants from six to eight ECA countries (and perhaps a few from North African countries) will be sponsored by WAVES, plus 10 resource persons and observers from EU member states and/or international organizations will join. Targeted participants are policy makers and staff from government institutions that are 1) users of data for development planning and policy making (e.g. development planning ministries, environment and natural resource ministries or other key line ministries) and 2) data providers (e.g. national statistical institutions). The workshop will provide opportunities for discussion, presentations, and hands-on training. The workshop will be conducted in English and Russian; translation will be available. Workshop participant directory and list of participants by country. The trainers and contributors will have representatives with experience on NCA methodologies. Technical experts will provide guidance and training on water and forest accounts. In addition, participating experts will have experience in ecosystem valuation, policy development, and development planning. * Presentations are available by clicking on the underlined agenda items. Note that some sessions did not use powerpoint presentations. * Note: Simultaneous English-Russian translation will be provided during the event.